Harrow was founded in 1572 under a royal charter granted by Elizabeth I to John Lyon, a local farmer. His new School House was completed in 1615 and his School, beginning with one recorded pupil, settled into its gradual, if not uninterrupted, growth towards being the modern and famous school of 825 boys it is today. By the beginning of the nineteenth century Joseph Drury could count among his pupils a quartet of future Prime Ministers. Later in the century two remarkable Head Masters, Charles Vaughan (disciple of Thomas Arnold) and HM Butler, brought to the School the far-reaching developments of Victorian education. No great institution can simply rest on its history, and, particularly in the last twenty-five years, there has been significant modernisation and, thanks to the continuing generosity of our benefactors, much notable building. Pupils have come from all over the world, and there is no 'typical Harrovian'. A favourite School Song celebrates the fact that "the range of Harrow" is a broad one: "Welcome poet and statesman too..." A list of famous Old Harrovians might indeed name many statesmen, including Peel, Palmerston, Churchill, Pandit Nehru and King Hussein of Jordan; poets and writers as diverse as Byron, Sheridan, Trollope, Dornford Yates and Richard Curtis; Lord Rayleigh, the physicist and Nobel prize-winner; Fox Talbot, the inventor of photography; the archaeologist Sir Arthur Evans and Bruce the explorer; Sir William Jones, father of philology; Admiral Rodney and Field Marshal Alexander; and nineteen winners of the Victoria Cross. 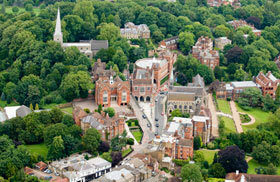 The School is situated on a 260-acre site close to central London. It is one of the few schools left in the UK which provides a full-boarding education for boys only aged 13-18. Academically, our aim at Harrow is to ensure that all pupils achieve outstanding examination results relative to their ability. Many departments run their own extra-curricular societies to stimulate interest, and lectures by distinguished speakers from outside the School are frequent. There are twelve boarding houses. There are no dormitories: a boy shares his room with a boy of the same age for the first three to six terms and thereafter has a room to himself. Harrow has excellent sporting facilities and fields teams at all levels in a wide range of sports. Pupils can play sport every day if they wish, and for the enthusiast there are many opportunities to play and excel. The arts are an extremely important part of Harrow’s packed calendar of activities. The Music department produces around sixty concerts a year, while the Drama department presents about fourteen plays a year. Pupils have the opportunity to learn about curatorship and art exhibitions in the Old Speech Room Gallery, and to see how the professionals do it across all these disciplines through trips to London’s shows, concerts and galleries.